If we don’t have it, we’ll help you find it! That’s our motto at Bryant’s Rent-All! Since 1953, we have been serving Central Kentucky’s special events and equipment needs with a smile! We are a family-owned business, now in our third generation and we’ll continue to keep our long standing tradition of quality and dedicated service to the people of Lexington, Kentucky and the Bluegrass. Everyone at Bryant’s Rent-All wishes to thank you for allowing us to be a part of your event. We appreciate your confidence in us, as we strive to make every event successful and memorable. If you have questions or concerns, please give us a call. We are here to help you! Thanks to all of our customers and I hope to see you in the store. 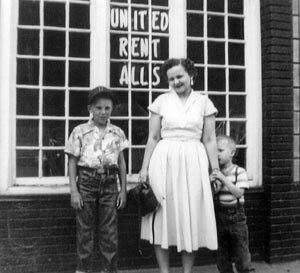 Mr. Vernon Bryant started in the rental business in Lexington, Kentucky in 1953, as a United Rent-All franchise store. His store was located at 531 South Limestone, just opposite the University of Kentucky. This was the first equipment rental store in central Kentucky. The telephone book did not have "rental" as a heading at the time, so Mr. Bryant was the first business under that heading. The store inventory was the typical United Rent-All mix of construction and party equipment. The first rental invoice was written for a baby bed, ordered just a few days after opening the doors. In the early 1960’s, Mr. Bryant decided to opt out of the United franchise and began operating as an independent rental store, changing the name to Bryant’s Rent-All. After eleven years in business, Bryant’s Rent-All moved to a new location, 875 South Broadway, and in 1972 the business was incorporated as Bryant’s Rent-All of Lexington, Inc.
Terry Bryant, Vernon’s son, joined the business in 1973 and became the second generation of the family business. Vernon Bryant retired in 1982 and handed the reins to Terry, who subsequently directed greater emphasis to party and event rental, while still maintaining the construction, lawn, and garden inventory. This has been a very successful strategy for the company. Scott Bryant, Terry’s son, joined the business in 1991 and is now the manager of tents and event rental. Bryant’s Rent-All is constantly growing and expanding to meet your needs, whether it be weddings and events, construction and tool, games, or tents, some of which span over 100 feet in length. Please come in and "if we don’t have it, we’ll help you find it."